Source: FOIA. Congressional RFI’s on Benghazi Urgent. The road to war with Syria, Russia, Iran and China can be tracked back to the Benghazi attack and cover-up. A Freedom of Information Act Request (FOIA) provides more evidence that the Obama administration declined to activate available possible life-saving help in the September 11, 2012 Benghazi attack that killed Ambassador Christopher Stevens, Tyrone Woods, Glen Doherty and Sean Smith –and thwarted the FBI investigation thereby aiding the perpetrators escape from justice. 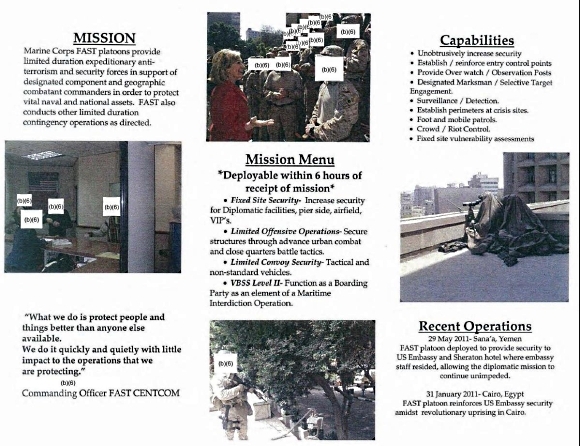 There were two U S Marine Corps response options that were never called in or deployed to Benghazi– Marine Corps Embassy Security Group / Marine Security Guard [MCESG/MSG] and Marine Fleet Antiterrorism Security Teams [FAST]. Read it all at marinkapeschmann.com.